Will Russia's MiG abandon the Indian race? The Indian tender for 126 MMRCAs (medium multi-role combat aircraft) to replace its ageing MiG-21s was announced long ago, but only now is the real intrigue unfolding. 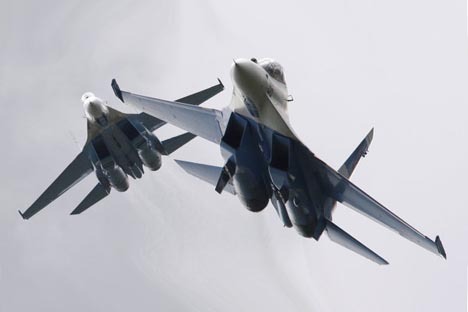 Competition between two main rivals - the United States' F/A-18E/F Super Hornet and Russia's MiG-35 has been stiff. The intrigue heightened after Russia announced its MiG-35 would not be on display at an air show in Bangalore. Many experts took the absence of a "real live" MiG as a sign that Russia was pulling out of the race. The Russian and U.S. fighters each have their own strengths. The Super Hornet's design maturity is indeed impressive. It has been in serial production for over 10 years and carries an active phased-array radar (APAR), which is also in serial production. The United States is also in a position to start manufacturing the aircraft for an Indian order at short notice. The MiG-35's advantages include India's experience of MiG-29s and the fact that maintenance infrastructure for them is in place across the country, as well as Russia's readiness to share production technology with India. The MiG-35's main shortcoming is its APAR: it is still in development and this is set to continue for a year or two. Also, despite its MiG-29 origins, the MiG-35 still needs refining before it can go into serial production. Fundamentally, the only thing the MiG-35 shares with the previous MiG-29 family is its appearance. Its equipment and facilities have undergone a radical overhaul. The aircraft is now capable of using the very latest air-to-surface munitions, making it a multi-role fighter, unlike the MiG-29, which is considered an air-supremacy fighter. The cockpit, in line with the current fashion, is equipped with multi-functional liquid-crystal display screens, while the HOTAS (hands on throttle-and-stick) system allows the pilot to manage all the weapons systems without taking their hands off the aircraft and engine controls. Vectored-thrust engines make the plane much more maneuverable, increasing its chances of winning in close combat and avoiding long-range missile fire. The fact that a two-seat version - the MiG-35D - is available, with the same kind of avionics as the single-seater, means that groups consisting of one- and two-seater aircraft can be formed, which are capable of carrying out highly complicated missions. In such formations the two-seaters become command planes, coordinating the moves of a flight or squadron. Unlike Russia, which decided not to put its MiG-35 on display in Bangalore, the United States has stepped up its activity and unveiled the latest version of the F/A-18, or the Silent Hornet, upscaled with stealth technology. These warplanes are kitted out with conformal fuel tanks, enhanced performance engines, spherical missile laser warning (SM/LW), enclosed weapons pads and next generation cockpits complete with internal infrared search and tracking systems. The aircraft on display at the show is the first to be developed as part of the International Super Hornet Roadmap program, which Boeing announced at the Farnborough air show last year. The fighter is being touted as a new generation in the Super Hornet family, which will feature improved combat survivability, situational awareness and performance for customers. Boeing's vice president Vivek Lall said that if India signs a contract with Boeing under the MMRCA tender it will be able to obtain this technology. "We are creating a platform which will be combat worthy for the next 30 or 40 years," he said. This announcement is unprecedented for an American company - until now only the United States' closest allies have been granted full access to this kind of technology. All the others had to make do with what they were sold. Tender results are expected to be announced this summer. They are particularly important for the MiG: should the MiG-35 fail to get an export order, Sukhoi aircraft will be left in a position of unassailable dominance on Russia's combat aviation market. Despite the unquestioned potential of Sukhoi platforms and their proven quality, such a monopoly is unlikely to be helpful.